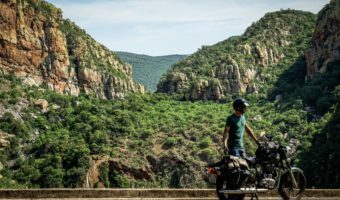 Discover the impressions of Eric, Lilian and Philip who went for a Vintage Rides motorcycle trip with a Royal Enfield in Rajasthan. « I had a blast », Eric. Eyes are turned when Eric Emschwiller, 59 years old, crosses the streets of London. 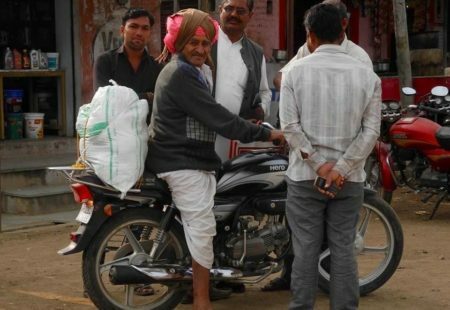 This dad and entrepreneur plies the capital on his new Royal Enfield. 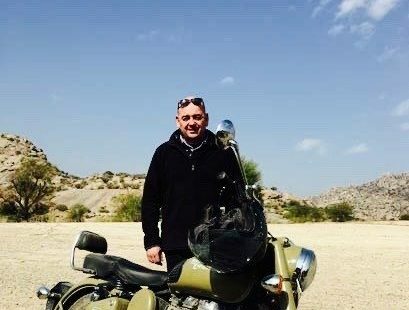 He fell in love with this motorcycle, ridden for the first time last January during a Rajasthan adventure tour with Vintage Rides. 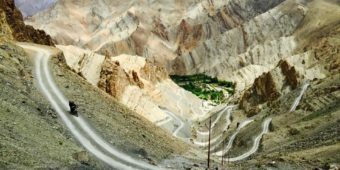 Before this trip, this motorcycle enthusiast had ridden Harley Davidsons on dream roads, from Thailand to the United States. In India, Eric discovered another way to travel. He stays under the spell. How did you decide to travel with us? I had planned a trip to the Maldives which got cancelled. Then I remembered a friend who had travelled with Vintage Rides in India. He told me it was an excellent experience and a good organization. 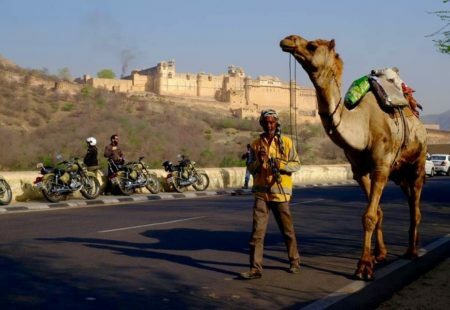 So I booked a spot on a Rajasthan motorcycle trip, the Rajasthan Adventure. 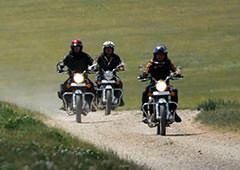 Your general impression of this motorbike tour? I had a blast! So much that I even bought a Royal Enfield back home. This trip was incredible. I met friendly and passionate people from my group. We all stayed in touch and are planning to go back together. I also discovered a great team at Vintage Rides and became friends with some of the staff. How did the Rajasthan trip go? The itinerary was very nice because it was off the beaten paths. 40% of the tour was on paved roads and the rest on tracks and trails. I loved it. Between 16 and 20 years old, I’d done a bit of enduro and I found this pleasure again. Also, the daily riding intensity was perfect. It’s great. It’s a moped! I had so much fun. I’m used to riding a Harley Davidson and of course this has nothing to do with it. I went from a 350kg bike to a 200kg one. 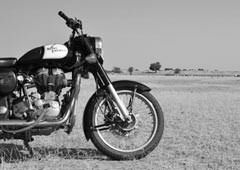 As the Royal Enfield is light, it’s pleasant to ride and not very tiring. It’s an easy motorbike to drive. 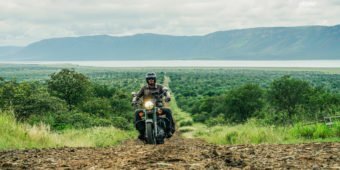 This aspect is also part of the trip’s appeal because you’re not tense and you’re on ease on the motorbike. 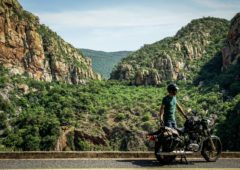 Any particular anecdote during this motorcycle trip? We got lost one day. We were four bikes. The mechanic was with us on a motorcycle and the support vehicle was further away. One of our friends broke down. The mechanic took a look at the bike and we thought he couldn’t do anything as his tools were in the support vehicle. He didn’t say anything and walked away for a few minutes. He came back with a rock in his hand and started hitting the bike with this rock. In 5 minutes, he'd repaired it! And still without a word, he tested it and gave it to our mate. I'd never seen it! The indian resourcefulness… It was quite unbelievable. Do you think you’ll travel with Vintage Rides again? 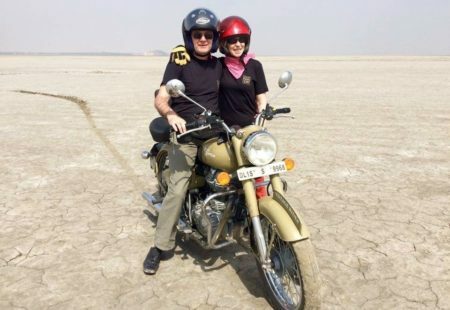 « Being a pillion on a Royal Enfield is easy », Lilian. Lilian, what is your motorcycle experience as a passenger? Lilian: I don’t drive and I’ve always been behind my husband. Younger, I used to really appreciate being a passenger. But today I prefer using the car on an everyday basis - for comfort reasons. However, when travelling, I love it! We’re closer to the locals, we’re in contact with the environment… I really enjoyed travelling to Rajasthan as a passenger. 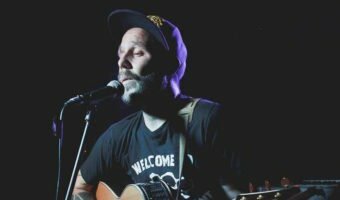 Philip: I admit not recognizing my wife! For the last ten years, I've offered to come with me on bike rides to go to the sea or elsewhere. In India, not only Lilian was motivated to come, but she had lots of fun also. I feel like she made up with the bike in India. Lilian, why did this trip change your relation with the bike? Lilian: I appreciated the comfort and the logistics. The support vehicle is following us, and whenever we stop to visit a place, we can put our things in the car and freely enjoy the visit. Whereas in France, as soon as we stop, we have to carry boots, helmets and jackets - not very easy to walk on a beach! In Rajasthan we travelled in really good conditions. The driver and mechanic were very caring for us. They were anticipating everything we needed and it was very enjoyable. This makes a huge difference. Isn’t it tiring to be at the back? Lilian: No! During the longest stages, I felt my knees for a little but it goes away as soon as we stop and stretch. Royal Enfield's seat is comfortable. In Kerala, there was no need to hold itself. In Rajasthan, tracks we take can be more isolated, and sometimes the pilot has to warn the passenger that he has no choice than to go over a hole. Philip: In the UK, comfort goes with big motorcycles. 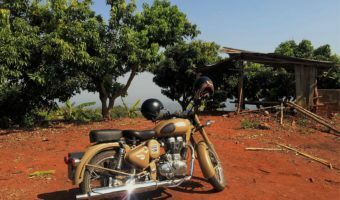 When you decide to go to India with a Royal Enfield, you know you’re not looking for the same way of travel, and it’s part of the adventure. But it has be to be said that Vintage Rides’ organization is very good. We don’t have to take care of anything, and the mechanic and driver are very friendly. How did you like Rajasthan? Philip: It was beautiful. 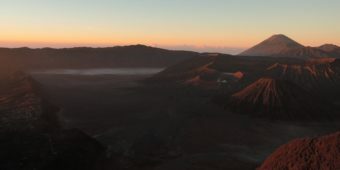 I found back lost sensations of a real adventure trip, in magnificent settings. 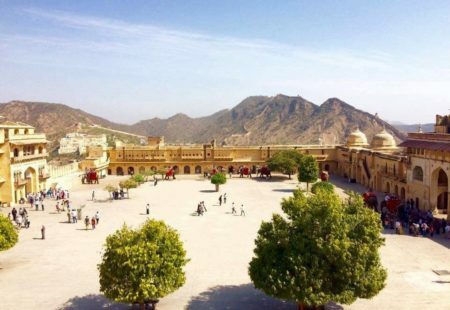 Lilian: Mountains, deserts, forts, palaces, cities, rural life, villages, Rajasthan is very rich and diverse. It’s a region which can please everyone. 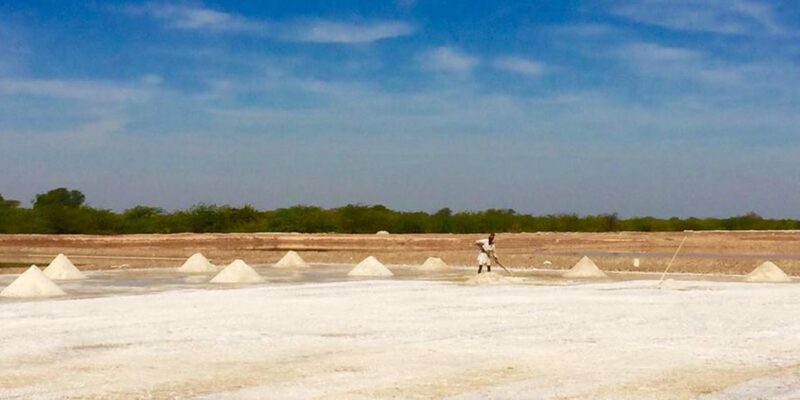 I still have in mind the outstanding images of women wearing colorful saris, carrying water jugs on their heads in these desertic landscapes… Then we stop in small villages. We take our helmets off and the children find out we’re foreigners. We observe beautiful scenes of daily life, away from the roads, in non-touristic places. It’s magical. 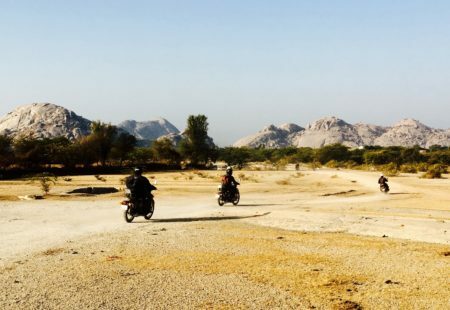 If like Eric, Lilian and Philip you want to experience an unforgettable two-wheel adventure in the land of maharajas, discover our motorcycle tours in Rajasthan.